When you're pregnant, eating healthy foods is more important than ever. 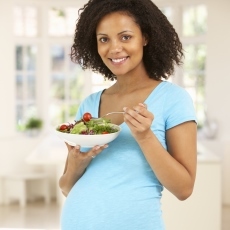 You need more protein, iron, calcium, and folic acid than you did before pregnancy. You also need more calories. But "eating for two" doesn't mean eating twice as much. It means that the foods you eat are the main source of nutrients for your baby. Sensible, balanced meals will be best for you and your baby. Most women need 300 calories a day or more during at least the last six months of pregnancy than they did before they were pregnant. But not all calories are equal. Your baby needs healthy foods that are packed with nutrients - not "empty calories" such as those found in soft drinks, candies, and desserts. Article: Elemental Metabolomics and Pregnancy Outcomes.